Connection Settings window allows you to specify database connection information and apply maintenance if needed. 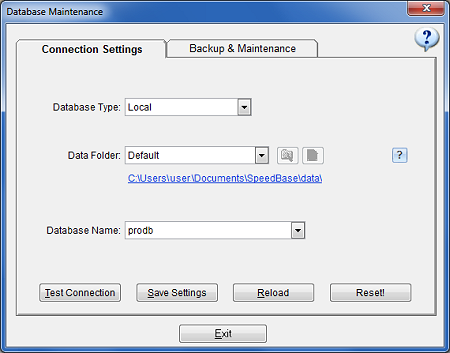 Database Type: By default "local" is selected here and SpeedBase connects to its built-in, local database. Starting with version 4.0 and later, SpeedBase also provides you an alternative option to connect to your database on an SQL server. You may find detailed information about this connection type on SQL Server page. 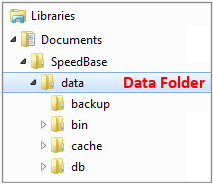 Data Folder: The "data folder" is the folder where your database and all other related data files are saved. When default selections are used, the data folder is located inside your documents folder of your computer. The path of this folder is "MyDocuments\SpeedBase\data" and you may navigate to that folder by clicking the path link displayed right under the data folder selection box. It is possible to move your data folder to a different location like a storage device or shared network folder, as long as you set the new location of the data folder here. Changing the location of your data folder is explained on this help page. This folder is also the only folder you need to copy when you want o take a backup of your data manually. Database Name: File name of the database. If you have created multiple database files, SpeedBase shows all available databases in this drop down list. You may switch to another database by selecting a different item from the list. Test Connection: Click to test whether the connection succeeds before saving the changes. Save Settings: Saves the current connection settings. Reload: Ignores changes and reverts the settings to the last saved state. Reset: Sets the connection settings to the application defaults. Do not confuse the data folder "DATA" with the "DB" folder which is a subfolder inside the data folder and should NEVER be selected as data folder. By default, the data folder is named as "DATA" by default, but it may have a different name if you have selected a different location on your disk in the past. Whenever you need to adjust connection settings after a new installation, or, you want to copy / move / backup your data, make sure that you are dealing with the right folder as shown in the example image below.